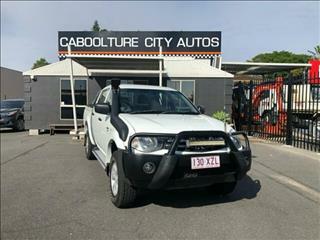 2011 Mitsubishi Triton GLR Manual Turbo Diesel 4x4 ! Just arrived with great Log Book Service History . This Triton is ready for your next adventure. Low Kilometres, Bullbar, Spotlights, LED light bar, Snorkel, Towbar, Sports bar, the list goes on !! All you need is here..Enquire today Easy Finance Available We are a family run business operating from morayfield for the last 17 years with 5000 plus happy customers, we stand behind the quality and excellent value in all of our cars we are also RACQ Approved Dealership......This vehicle is supplied with a current QLD Safety Cert (RWC) and a clear title PPSR Certificate, we sell cars throughout Australia so they are advertised excluding Registration and Government charges. PLEASE Note our vehicles are advertised automatically through the Redbook code and are not specific to this vehicle. Please confirm all advertised details prior to Purchase, THANKS.